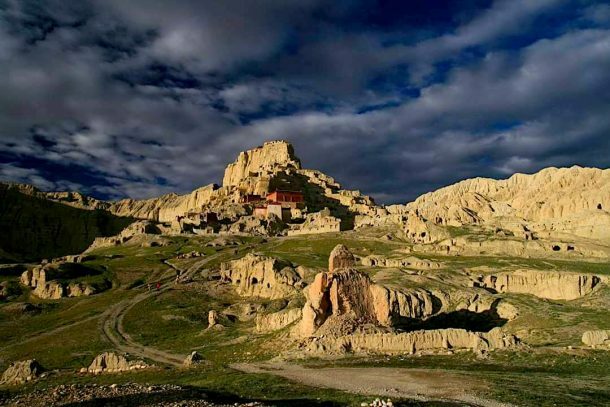 One of the ancient kingdoms of Tibet, the Guge Kingdom was founded in western Tibet, in the area now known as Ngari Prefecture, in around the tenth century. Following the collapse of the great Tubo Empire in central Tibet, the descendants of the last Tubo King moved west to escape the insecure conditions of U-Tsang during a civil war over the succession of the Emperor. After moving to the west with their followers, the grandson of the last Tibetan monarch and his children established an empire that would last for 700 years, more than three times as long as the Tubo Kingdom. So why did this empire, which lasted longer than any other in Tibet, suddenly disappear from the face of the Tibetan plateau, leaving behind only empty houses and broken temples? For many theorists, the mystery of the Guge Kingdom sits right up there with the sudden collapse of the ancient Mayan civilization in South America and the disappearance of the entire crew of the Mary Celeste in the middle of a meal. The ancient kingdom had a population of around 100,000 inhabitants at its height, and despite the various wars, plagues and conquering that happened over the course of the 700 reign in the west, none of the incidents were enough to completely decimate this civilization to the point where none remained. 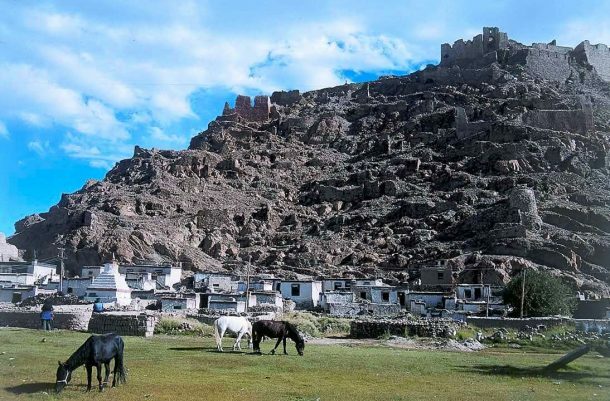 Today, only a few ruins are all that is left of the huge Guge Kingdom, which stretched across Ngari and into Ladakh in what is now Jammu and Kashmir, as well as large parts of what is now Himachal Pradesh in northern India. While this area was a region of dried hostile desert with fantastic clay forests dotted across the nothingness, there were oases of civilized areas on fertile lands across the desert. And none was more fertile than the area of what is now Tsaparang in the Garuda Valley, the capital of the Guge Kingdom and the site of the famous Guge Ruins. Close to the border with modern-day Ladakh, to the west of Mount Kailash, Tsaparang was a huge fortress that sat perched on a pyramid of rock that rose 500-600 feet above the sands, at the end of a long spur of rock. An impregnable fortress, the tunnels and caves that were the rooms and corridors of this palace were carved out of the very rock of the outcrop, and lying at its base was the village of the common people. Variously, the Guge Kingdom was dominated by first the original grandson of the last Tibetan Emperor and his three male heirs, a Mongol Invasion in the 13th century, a Sakya monastic regime in the 14th century, and once again by the natural-born kings from the latter part of the 24th century. In the early 17th century, there was a revolt from Ladakh, and the forces of the Ladakhi people laid siege to Tsaparang, the Impenetrable City. And this is where the details become vague as to what happened and why the civilization vanished. 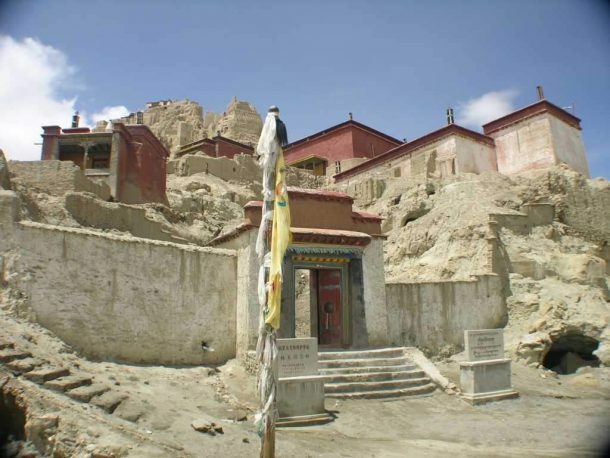 After treacherous advice from the chief lama of the Buddhist temple in Tsaparang, who was also the brother of the pro-Christian King, the city is said to have surrendered to Ladakh. One legend tells of how the people continued to survive in their usual status, while the king was brought to Ladakh as a prisoner. Another legend tells of how the Ladakhi army slaughtered almost all of the people, with only a few escaping, who fled to the south, vowing to return and wreak vengeance on the Ladakhi invaders. It is also said that the brother of the king was executed by the Ladakhi army after the surrender, and that the last male descendent of the last king of Guge left for Lhasa and died there in 1743. Yet another version of the history of the city of Tsaparang says that the Guge King threw himself from the cliff and died, although there are no factual records to support any of the stories. One strange legend tells of how the Ladakhi rulers, who were cruel and despotic, forced the Guge people to begin building an aqueduct to siphon the run-off of melting snow and ice from the nearby Mount Kailash. Angered by the arrogance of the Ladakhi rulers against the sacred mountain, the gods laid waste to the city. It is interesting to note that the Guge Kingdom and Tsaparang were later recorded to have been conquered by the armies of the Central Tibetan government, under the rule of the fifth Dalai Lama, Ngawang Lobsang Gyatso. However, once again, there is a mystery surrounding this. The armies of the Dalai Lama forced out the Ladakhi invaders in 1680, after 50 years of rule, and annexed the city of Tsaparang and the entire Guge Kingdom. The Buddhist records of the time are clear that the former Guge Kingdom was brought into the fold of the Central Tibetan government of the Gelug School of Tibetan Buddhism, and that Gelug lamas were sent to rule the former kingdom. It is said that, in the first half of the 20th century, the Tibetan government sent soldiers to Guge to collect taxes under a new taxation policy. For more than 200 years, nothing had come out of Guge in western Tibet, and when the soldiers went to the kingdom to collect the taxes owed, they came back to report that all that was left of this once-great kingdom was a deserted and ruined city, the desert already encroaching into the holes and tunnels in the rocks. Many years later, a cave was uncovered among the 879 caves, 445 houses, 28 pagodas, and the vast network of tunnels that made up the upper city. Inside the cave they found skeletons of around 30 men, and young women were discovered, some wrapped in ancient robes. However, all of the skeletons found were without heads, and to this day, none of the skulls of the dead Guge inhabitants have ever been found. Some believe this to be a testament to the brutality of the war against the Ladakhi invaders, while others believe it to be a special kind of funeral cavern, as cloth wrappings and braided hair were also found inside the cave. What has never been discovered is why, between the conquering of the Guge Kingdom by Central Tibet in 1680 and the arrival of the tax-collecting soldiers in the early 1900s, this wealthy and civilized society vanished almost overnight, leaving nothing behind by the frescoes and murals that adorn the walls of the palace and the pagodas. 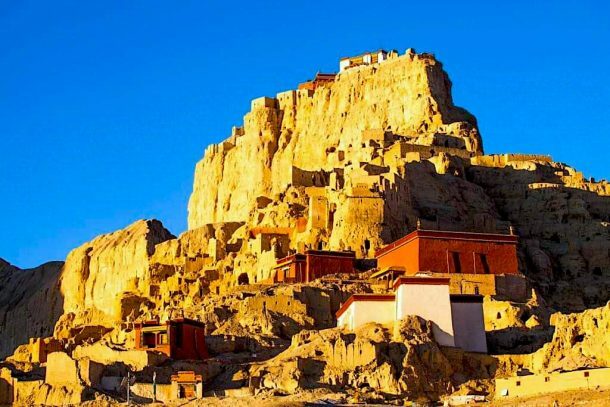 Now, the Guge Kingdom is a major tourist attraction in western Tibet, as well as being a rich archaeological site that has a wealth of information on the study of the rise of Buddhism in Tibet. One of the major promoters of the Buddhist religion into Tibet from India, the Guge Kingdom had a significant role in spreading Buddhism across the plateau. Yet this Buddhist state was rocked by war and eventually vanished back into the desert sands from whence it rose. An amazing story of an amazing kingdom in western Tibet, maybe we will never know what really happened to the inhabitants of this huge power in the west.